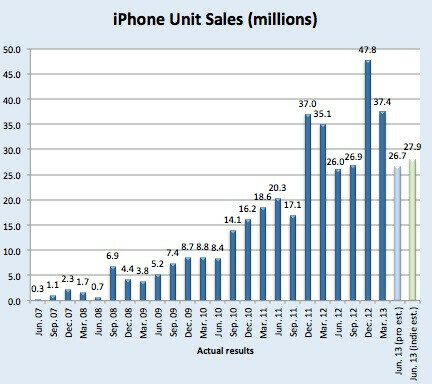 A couple years ago, September to December of 2011 to be exact, Apple enjoyed a 113% spike in iPhone sales. Last year, the growth was less, “only” 28%, but that was on top of the heap of devices the company had already moved. For Apple’s fiscal year third quarter, projections are that Cupertino will report about 27.15 million iPhones sold, up about 4.3% from same period last year, or 26.03 million. Those estimates are a blend between Wall Street pros and other “independent” analysts. When compared to the bulk of Apple’s sales trend, it is not a horrific outlook. When contrasted with the spurt in sales with the new models being introduced, particularly in 2012 and 2011, things do not look so hot. Given that Apple is selling three iPhones right now, likely to become four models later this year, the dilution of the iconic device is still managing some growth even in matured markets. The volume of units being shipped is still an envious position to be in, and the pressure on Apple is indeed a high-class problem. It also explains why Apple hopes to have a new hit on its hands with the iPhone Lite, assuming it is priced well enough to be attractive in emerging markets like India and China. However, in just a couple years the landscape is much different. Apple is facing a much larger competitor that is Android and its breadwinner, Samsung. Nokia has been making strong inroads with its own affordable models and a host of Chinese manufacturers are gluing together more and more cheap gear for use in Asia. Apple’s earnings call is on July 23rd and at that time, all will be revealed. Everyone is waiting for the iP5S. 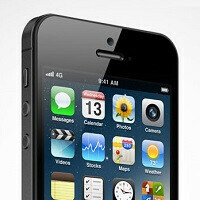 Who in their right mind would sign a contract for 2 years when the iP5S is coming in September? Only someone desperate (as in their phone got broke). Why, it's going to look the same, have the same OS and be as boring as the previous six models. Maybe they are hanging out the be the first to drop, smash, blend or fire a gun at it for a Youtube video? "Why, it's going to look the same, have the same OS and be as boring as the previous six models." Not for those who have drunk the Apple Kool-Aid. There are even some of those types on PA. For them, they will be standing in line at the Apple store or waiting at their front door for the FedEx truck. Like they were going all the way back to when the iP1 went on sale. you need a different phone every year, some ppl dont. they need a well function, worry free phone. That's Kool-Aid, no such phone exists. hmmm, i thought so. in their ios7 event they said some things that gave me the feeling apple isnt gonna make budget anything, especially not phones. Apple is down after Jobs died. Have u seeen anything new in iOS since 2007 ?? !!! well afta 6 years they gave an update copying every feature Popular Smartphones have currently on the market !!! Nothing more or less than I have seen from android! The two I'm buying will help out a little. Hurry up Sept.
And after they went to the 4" screen, kind of figured their sales would have been much higher as a result.